Never before has such a durable ultra high speed burnisher been offered at such an affordable price! This 1500 RPM machine is considered an ultra high speed burnisher, because it spins faster than 1000 RPM. Anything over that threshold of 1000 RPM, is considered a ultra high speed machine. Take a look at our complete line of electric high speed burnishers for other options in this category, including our even more economical high speed floor polishing machine. The Task Pro 1500 RPM burnisher comes with a 5 year warranty on the power train, and 1 year on all wear items. This provides another great value for this economical machine. The flexible pad driver allows the machine to be used on any surface that has a nice coat of protective wax on it. 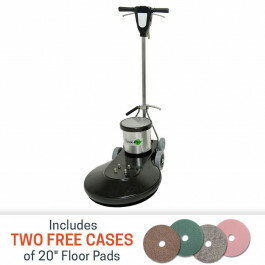 Using this machine on a floor without any wax on it, can void the warranty due to unnecessary stress placed on the motor. This machine should be run on a 20 amp circuit due to the powerful motor. If a 20 amp circuit is not available, you can get by with using a more aggressive pad (which draws less resistance), and using a mop on floor restorer. When using this machine with a spray buff solution and a soft pad creates more resistance and can cause your machine to constantly blow breakers. We recommend using a mop on polishing solution with a 20 inch hog hair burnishing pad. All metal construction provides for a durable, heavy-duty machine. 1.5 HP D.C. rectified motor powers this 1500 RPM ultra high speed burnisher. Safety lock-out switch prevents accidental start-up in all situations. Flexible pad driver and large transport wheels make this burnisher ideal for any job. Comes with a 5 year warranty on the motor/gear box and 1 year on wear items. 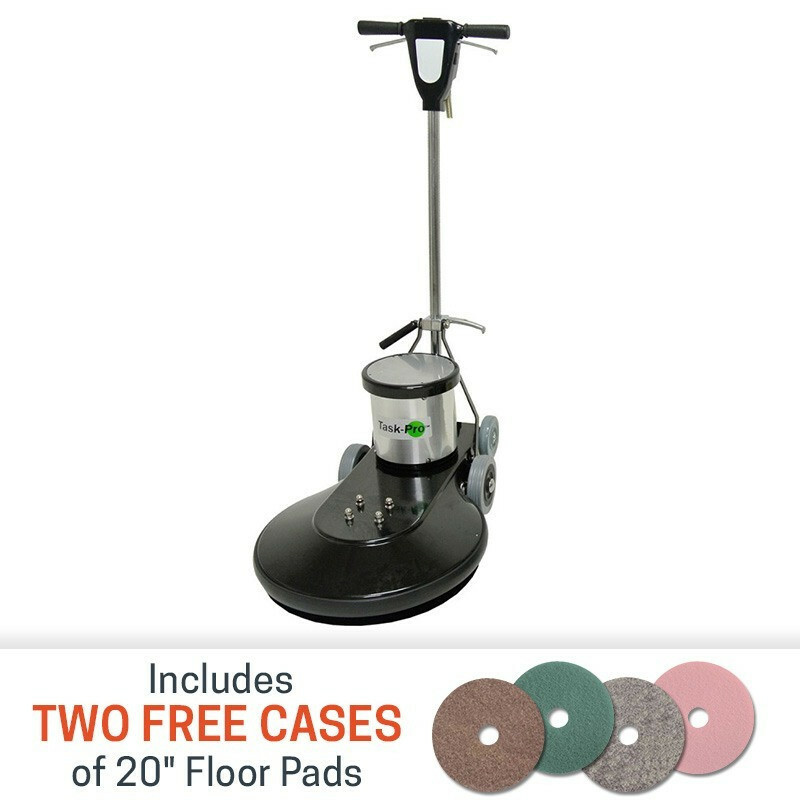 Great for high speed burnishing floor programs. Each pad has different floor styles that it will work best on. Made from 100% post consumer & industrial recycled waste product. Customers who were interested in the Task-Pro™ 20 inch Ultra High Speed Burnisher - 1500 RPM were also interested in the following items. This is a review for the Task-Pro™ 20 inch Ultra High Speed Burnisher - 1500 RPM.